Sugar masquerades under a variety of guises, below you will find a list of more than a 100 synonyms of sugar. The FDA has not added an “Added Sugars” line (in grams) within the “Sugars” section on the nutrition facts label. Instead, sugars are only mentioned in decreasing weight order on the ingredient list, not by percentage of calories. As a marketing tool, many food companies have used this information to mislead consumers by making nutritional information on the product appear to be healthier and lower in sugar. Not only are they using some of those tricky sugar synonyms in the ingredient list, but they’re also using several of them, in a single product. Added sugars, regardless of their name do the same thing to food, it makes them taste sweeter and for the food addict much more addictive. 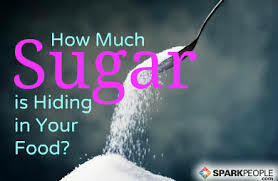 So by dividing the total amount of added sugars into three or four different sugar names, companies are able drop their added sugars further down the list (the less the weight, the lower the rank on the ingredient list). So for example, if a manufacturer wants to sweeten up a certain brand of crackers, it can either do this using 15 grams of “sugar” or, 5 grams of “malt syrup,” 5 grams of “invert sugar” and 5 grams of “glucose”. Some manufacturers seem to be choosing this divide and masquerade method, placing these ingredients lower down on their products’ lists, making us believe that the amount of sugar in the product is smaller than it is.